The company reported earnings this morning before market opening. The stock tanked almost 6%. This was great for our remaining calls. We closed our call side of the trade this morning. As of now, we are out of the entire trade for a profit. Closed put side of the trade this morning. Still holding the call side. I like trading strangles. I consider them save and very profitable trades. There are risks involved but if you know how to work with risks, you have nothing to fear. And if there was no risk, there would be no money made. 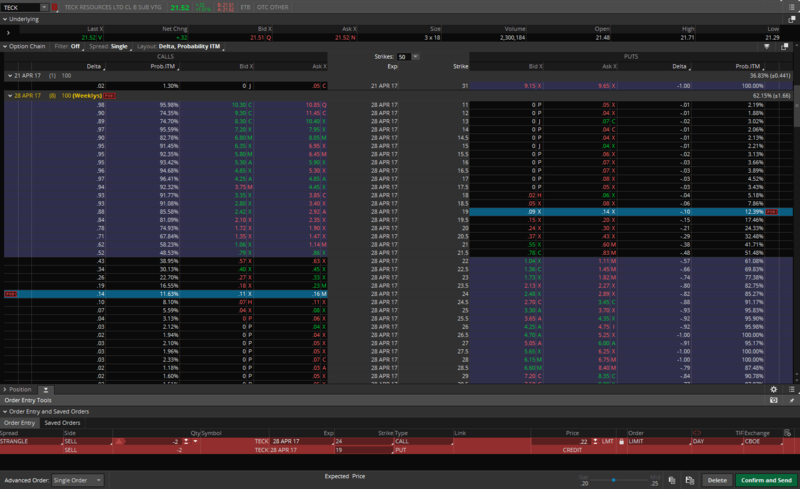 Note, TECK reports ER in this expiration week so the trade may be too risky for some novice traders. I am also widening my strangle spread should the stock act violently after reporting . The trade executed for 0.22 credit (total 0.44 credit or $42 dollars). I immediately placed a buy back order to buy both legs separately for 0.05 debit.